Last year I was involved in The Cost of Living blog tour and rather fell in love with Ant and Bea so when I discovered their adventures were continuing with a second book I was so excited, Dead Stock immediately made my list of November releases I was looking forward to! 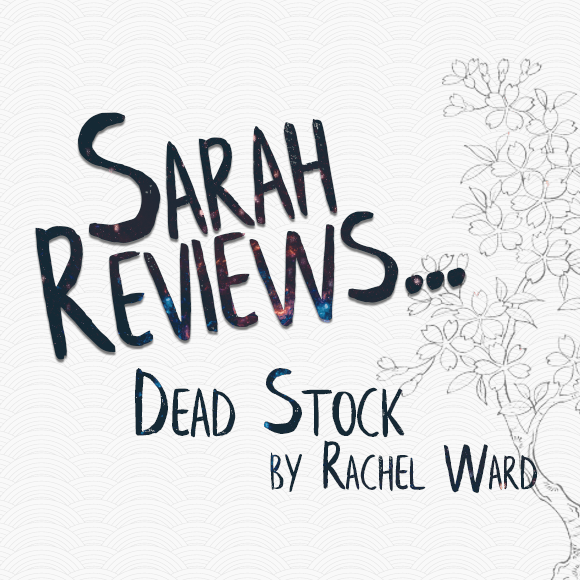 Then Ceris from Sandstone Press got in touch and asked if I’d like to be involved in the blog tour for Dead Stock and I jumped at the chance, I just couldn’t wait to catch up with Ant and Bea again, so I’m incredibly happy to be sharing my Dead Stock review today, on publication day! A new year is beginning for Ant and Bea at Costsave, and after the events of the year before this includes a new manager at the supermarket. Following the events that shook Kingsleigh the year before you might think Ant and Bea would be hoping for a nice quiet new year. Unfortunately when Ant finds the body of a cat in the cardboard recycling bin, Bea realises that the cat belongs to one of their coworkers, promising to find out who is responsible Bea brings herself and Ant into something bigger then she had imagined. As much as I enjoy the plots of the Ant and Bea mysteries (and I really do!) so much of the enjoyment I got from reading The Cost of Living came from the characters and Dead Stock is no different, Ant and Bea are just so likeable and I really do have a soft spot for them. For me Ant is a bit of a star in Dead Stock, stepping up to take first aid training when nobody else wants to he soon finds himself saving a customer’s life. At the same time Ant is really struggling with his home life, his father does something he really shouldn’t have, and Ant’s family are left facing the consequences. Ant in particular has to deal with a lot that I won’t go into because spoilers but I spent an awful lot of the book wanting to give him a big hug, despite everything he was still there for Bea. Bea herself, you just can’t help but like her, she’s forever trying to help others, whether it’s her mum, a colleague or one of her regular customers. She’s incredibly intelligent and determined, which is a combination that occasionally leads to trouble, but as much as you might want to tell her to stop and call the police instead that would make for a very short book! I was also really pleased to see Queenie making so many positive steps throughout Dead Stock, never underestimate the power of a dog! I do think it’s a huge testament to Rachel Ward’s writing that even after just a single book I was already so invested in Ant and Bea’s characters, from wanting to give Ant and hug to wanting to give Bea a bit of a shake at times, I mean come on Bea Tom is really not worth it! I have to say it’s not even just the central characters either, as I said before I really loved seeing Queenie’s improvement in this book, I really enjoy reading about Dot, and I find myself worrying about Julie, one of Bea’s regulars. It’s so easy to just submerge yourself into their whole world. I’m not sure I can recommend the Ant and Bea mysteries highly enough, Dead Stock is perfectly readable as a stand alone but I would suggest reading The Cost of Living first to really enjoy it to the fullest! Rachel has created some wonderful characters who are just an absolute pleasure to read, perfect for all those who love cosy crime but also for those who normally enjoy their crime at the dark and gritty end of the spectrum but are looking for a little break! I was lucky enough to meet Rachel at an event in Edinburgh at the beginning of the week and to discover she’s working on the next Ant and Bea mystery, I simply cannot wait to discover what the pair get up to next! As always if you’ve read the book let me know what you thought! If you’ve not read it yet will my review convince you to pick it up? Be sure to check out the other posts as Ant and Bea go on tour! Top Ten Tuesday – Bookish Merchandise Shops I Could Spend All My Money On! Thanks you so much for this lovely review! Was brilliant to meet you in Edinburgh. I noted your worry about some of my characters and I’m writing book 3 as fast as I can!